Destiny, desire, fate, the will of the Almighty, or mere circumstance has brought many from Latin Christendom to the shores of Asia. 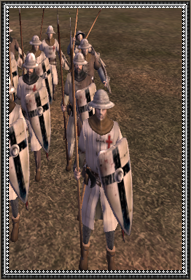 Though what drives them to the Holy Lands and those beyond vary, what unites these wayward children of the Latin West is the brotherhood brought on by war. Too poor to afford horse, too rich to be sequestered to that of skirmishing crossbowman, they assume the role of strong-armed spearmen./n/nVeterans of battle, these soldiers have affored themselves medium quality mail hauberks and assorted paddings of leather and quilt, backed by sturdy shields and strong spears. A shield from which the knightly sword of Christendom might strike, they pitch their services to any nation of Christendom. Truly the wandering blood of their Germanic ancestors has lingered on, as well as their martial spirit. Motivated and well equipped pilgrims, mercenaries, and settled Franks serving the Christendom of the East as sturdy spear-bearing infantry.